When Microsoft released the new Ribbon-based interface in Office 2010, there was much wailing and gnashing of teeth. It was as if Microsoft had unleashed a biblical plague. Indeed, the general consensus (or hope) for awhile was that Microsoft would see the error of their ways and return to the menu structure of old. Flash forward a few years, however, and the Ribbon interface has been largely accepted and, even, applauded by many of the same people who originally labeled it as ungainly, inefficient, and an insult to those who had spent years memorizing the old Office menu structure. Over time, however, the Pareto principle has been proven right once again: something like 80% of users really do use something like 20% of Office’s functionality, and making that 20% more readily accessible makes good sense. In short, the Ribbon really does expose most of the features that most people use most often, while making it easy enough for power users to access the other, lesser-used features upon which they’ve depended to maintain their power-user credentials. To the surprise of many (or at least myself), the Ribbon has now been largely recognized as an improvement, and Microsoft’s choice in making it mandatory and immediate a wise one. Of course, it’s not like Microsoft made this bold move without industry precedent to back it up. In fact, one might say that they took a page from Apple’s playbook. After all, Apple drove the industry to kill the floppy drive in favor of USB ports, is in the process of killing off the optical drive, and when they made the switch to Intel-based processors, they weren’t terribly gentle on their loyal Motorola-loving user base. And so here we are again, with Windows 8 representing an even more profound change, this time not only to an application suite (albeit a vital one) or to a hardware paradigm, but to the very foundation of the world’s most-used operating system. If the Office Ribbon was a nose job, then the Windows 8 modern UI is a complete facial transplant. Even with the tweaks in the upcoming Windows 8.1, like a faux-Start button and the option to boot straight to Desktop mode, Microsoft has given users virtually zero choice in the matter—it’s the modern UI, or bust, for a great deal of functionality. So, what’s a user to do who’s programmed the Windows 7 Start Menu into their muscle memory? Well, perhaps more than anything else, it’s time to stop fighting the inevitable. Windows 8 is here to stay, and while one could stick with Windows 7 for awhile, the writing is on the wall: the future of Windows (and computing in general, it seems) is touch, and the modern UI is a far better touch-based user interface than Windows 7 could ever hope to be. At the same time, there’s a bit of a contradiction at play, specifically the continued existence of the Windows 7 desktop. While I’ve said that Microsoft has given users no choice in transitioning to a new way of working with Windows, they’ve definitely hedged their bets. They recognize that there are literally millions of legacy apps out there that users depend on to get their work done (including Office itself), and I’d argue that they recognize that touch-based application design hasn’t progressed—on any platform—to the point where feature-laden applications like Microsoft Word, Adobe Photoshop, and a myriad other powerful, complex software solutions are possible. In fact, I’d submit that pure touch may never get there; it’s simply not precise enough. So, Windows 8 really has three distinct modes that work to bridge the past and the future. First, there’s the aforementioned desktop mode, which is where the real work gets done. Then there’s the full-screen, modern UI mode, which Microsoft hopes will be stocked with compelling touch-based applications that fill the competitive need for information and entertainment consumption (video, browsing, reading, and light gaming are a few examples). It’s worth noting here that Apple is also pushing full-screen apps in OS X, the utility of which I have yet to discern (other than forcing one to focus on a single task, which if that’s the point seems a bit pretentious on Apple’s part). And finally there’s the modern UI itself that ties everything together. It’s the UI that I’ll be focusing on here, because that’s where the biggest adjustments are to be made for those migrating from Windows 7. The debate over whether the traditional clamshell notebook with a touchscreen lends itself to touch-based applications has yet to be settled. Having used such a machine myself, I’d say that it does—it’s really not that arduous to lift one’s finger to a vertically-oriented screen and flick, scroll, and gesture, no matter the opinion of the late Steve Jobs. * In other words, although certainly a touch-centric UI is best on tablets, it’s not at all lost on touchscreen notebooks. For me, the transition to Windows 8 hasn’t been all that difficult, because I realized quite some time ago that Microsoft was heading in a new direction and I chose not to fight it. The addition of the Search field and the ability to pin apps to the Start Menu really presaged Windows 8, if you think about it. And so I abandoned the menu structure itself long ago. In Windows 7, rather than hit Start, then Programs, and then dig my way to an application, I’ve learned to either click on a pinned app on the Start menu or the Taskbar (my most-used applications, natch), or I search for an app using the Search field. I’ve simply found this far more efficient. Only when I can’t remember the name of a seldom-used app do I resort to using the menu. So how do I use Windows 8? Well, it’s simple, really. I have my most-often used apps pinned to the Start Screen, which I access by hitting the Windows button on the keyboard, or I hit the Windows button and start typing to search for the app. When I need to find that less-used app whose name escapes me, I swipe down from the top and click on “All Apps.” I also pin apps on the Taskbar in deskop mode, just like I do in Windows 7. In fact, if you consider these two images, you’ll see that I actually have more apps immediately available to me in Windows 8 than I do in Windows 7. I lose the ability to select recent documents, but honestly, I don’t use that too often in any case. And again, once I’m back in desktop mode, my workflow is almost exactly as it was in Windows 7. Indeed, given the relative dearth of modern UI apps and my reliance on legacy Windows 7 applications, I spend most of my time in desktop mode. Yes, at first, transitions from desktop mode to Start screen can be jarring, but I’ve become accustomed to it all fairly quickly. On a Windows 8 tablet, it even feels fairly natural, and if Microsoft ever convinces developers to make the right modern UI apps, then things will become even more compelling. 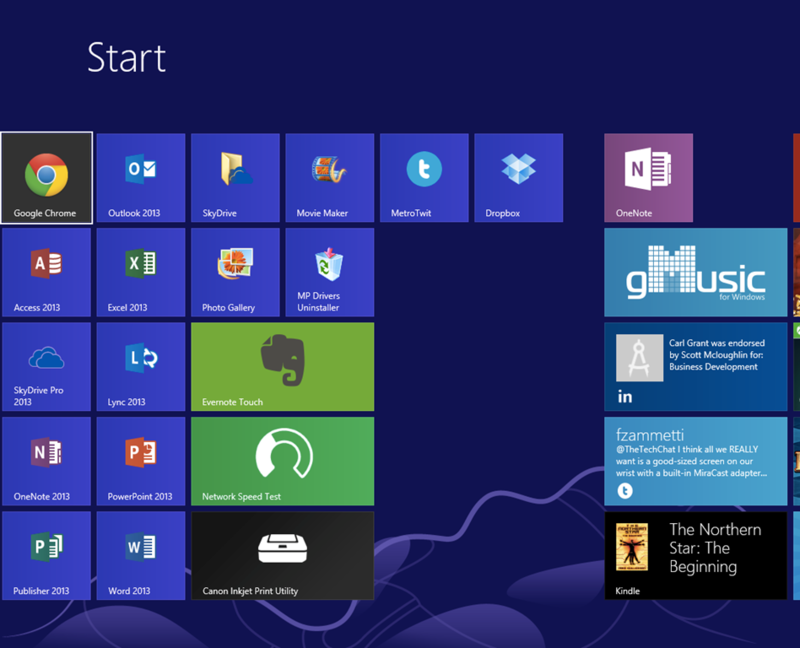 Stuck with the Start Menu? 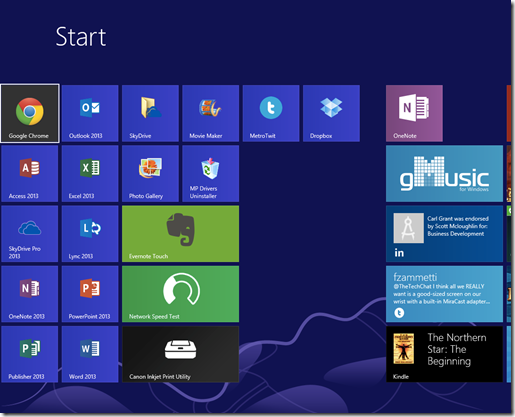 If you’re adamant about holding onto the Start Menu, however, then you’re still covered. There are a number of apps out there that provide a Windows 7-like Start Menu, and the most popular seems to be Stardock’s Start8. It’s pretty inexpensive at $4.99, and it offers even more functionality than simply adding back the Start Menu. If you’re careful, you could probably spend 90% of your time—or more—in desktop mode and barely tell that you’re using Windows 8 at all. Start8 even allows you to boot directly to the desktop, just like Windows 8.1 will do when it’s released in October, meaning that you might be able to avoid the Start Screen almost altogether. I realize that I spent more time introducing these tips than I did in providing them, but I think that was justified. The difference between Windows 8 and Windows 7, in general workflow, isn’t really as great as it seems. The aesthetics are drastically different, and the general consensus has therefore been so negative that what’s really good about Windows 8 has been lost in all the noise. And perhaps the most important benefit to Windows 8 is that it works the same on all sorts of devices, from touchscreen notebooks to tablets to hybrid devices that can act as both. Over time, this flexibility should serve as a tremendous benefit, by allowing users to work in a familiar environment no matter what kind of computing device they use. One important caveat: if you’re using a notebook without a touchscreen or a touchpad that supports Windows 8 gestures (although there might be options here, too, if you’re using a Mac), then Windows 8 will be much more painful. Even apps like Start8 can’t make up for the fact that you will, at some point, have to interact with the modern UI for some things. Even just a touchpad that supports Windows 8 gestures makes things livable; without one, you’re going to be mousing around far more than you’re used to. For those folks, I recommend sticking with Windows 7 until you upgrade to a touch-based machine. Let me know in the comments if I’m making sense here, or if I’m all wet. * Steve Jobs was a wizard at denigrating competitive products shortly before introducing Apple’s own variant. He said that nobody wanted to watch video on small screens and then introduced the iPod Video. He said that nobody reads anymore (in reference to the Kindle), and then introduced the iPad with iBooks. There are a number of other examples. And so his saying that nobody wants to lift their hands up to manipulate a noteboook touchscreen could very well have been just a precursor to Apple introducing their own version, before his untimely passing.